HomeFull XL Bariatric Alternating Mattress System 80" X 54" X10"
Full XL Bariatric Mattress 80" X 54" X10"
This Full Size Bariatric Alternating Pressure Mattress series is an advanced alternating pressure relief system suitable for high-risk bedsore patients. The digital controlled pump unit, which provides adjustable pressure and cycle time, is compact and effective in pressure control and management. The alternating replacement mattress, offers a low air loss therapy, and provides patients a comfortable pressure support suiting for each individual. The patented cell-in-cell design allows the inflation and deflation of air cells to be achieved in the shortest amount of time while providing the good pressure dispersion. The inner cell also offers a sufficient weight support during a power failure. 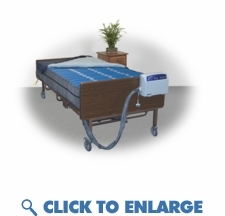 This medical Alternating Pressure Mattress System is ideal for home care and nursing home use and supports up to 1000 lbs. The alternating replacement mattress, offers a low air loss therapy, and provides patients a comfortable pressure support suiting for each individual. The patented cell-in-cell design allows the inflation and deflation of air cells to be achieved in the shortest amount of time while providing the good pressure dispersion. The inner cell also offers a sufficient weight support during a power failure. This medical Alternating Pressure Mattress System is ideal for home care and nursing home use and supports up to 1000 lbs. Smart sensor technology with easy recognized graphic icons. AutoFirm function to inflate mattress quickly and facilitate patient to access. Low pressure indicator illuminates when the pre-set pressure is not reached. Panel Lock function prevents persons other than caretakers from changing the settings. Seat-Inflate function assist patient to sit-up. Vapor permeable, water resistant and fire retardant cover. Intubation facility to active emergency intubation. Emergency CPR deflation for rapid deflation of mattress. Product Name: Full XL Bariatric Alternating Mattress System 80" X 54" X10"